Always Ready, Even Under the Most Difficult Conditions! A soldier who, thanks to the latest high-tech equipment, sees just as well in the dark as in the daylight, is 100 percent bulletproof, can shoot “around the corner” and can jump three meters high with the help of an artificial exoskeleton - in short, a soldier who represents a fusion of person and machine. This soldier is not a science fiction figure - this is the “Soldier of the Future”. A number of countries have been working on such special equipment for some time now. IdZ, FIST and FELIN are just a few of the programmes around the world studying this topic. The objective of each programme is to improve the safety of the solider in the field and make the use of the equipment more convenient. In the past, soldiers in the field were given very simple equipment and had very little opportunity to contact their commanders. Today’s soldiers are both strong warriors and fully equipped communication and weapon systems. They are outfitted with a multitude of electronic devices, such as a navigation system, battery pack, headset, warning sensors, video visor for weapons, night vision glasses and many more items necessary for “modern” warfare. All of these devices have to be connected by means of wiring harnesses and top quality, reliable connection systems. “Wireless” is not an option here because of speed, stability and data security problems in data transmission. Multiple interfaces are always a risk, and system connectors that are 100 percent reliable are particularly needed for the “Soldier of the Future”. ODU, the connector manufacturer from Mühldorf, Germany, has developed a new connector series especially for the “Soldier of the Future”. This series makes all of the individual components for the solider of the future “pluggable”. ODU is already participating in various programmes around the world for the “Soldier of the Future”. This experience has led to the development of the new ODU AMC product series, in order to even better satisfy the requirements for the future placed on connection systems in this segment. The ODU AMC provides weight reductions of up to 60 percent compared to standard push-pull connectors. The use of aluminium results in an extremely robust housing that can stand up to the most difficult conditions. The mechanical coding options allow perfect and blind insertion with no restrictions. Incorrect insertion is impossible. A further advantage is the colour coding, which is a great help when the equipment is being cabled. The colour coding has been designed so that it can be seen only before insertion, and disappears completely in the inserted state. The ODU AMC series’ flexible design makes it possible to provide connectors with push-pull locking or a pull-off function, as break-apart connectors with flexible pull-off strength or with integrated electronics (for insertion and removal under load). The product programme naturally also offers a model with pressure contacts (on the cable and device sides), so that swift and effective cleaning is possible, even in the field. If needed, a self-cleaning version can also be deployed. The housing and the contacts in the new ODU AMC series stand up to more than 5,000 mating cycles. The use of special materials even allows a version that can be plugged under load (hot plugging). Standard push-pull series tend to have no chance in this area, because “plugging under load” generally destroys the contacts. Excellent shielding properties (up to 360°) ensure that there are no disturbances in the data and signal transmission. IP68 protection additionally ensures that the connectors are even protected against dust and water penetration (pressure-sealed). With an operating temperature range of -55° C to +125° C (roughly -65° F to 255° F), the connection system even stands up to the most difficult conditions in cold and heat. The flexible insert design makes it possible to integrate signal, high and low voltage transmission, coax/triax, optical fibres and compressed air and fluid feed through in one connector. The goal of the new ODU AMC series is to do more than just give the “Solider of the Future” individual connector components. The goal here is to provide a complete system that is perfectly tuned to each special program. Connection system, including the necessary cable + assembly, and, where needed, individual extrusion or special potting - in short, the complete wiring harness needed. The advantages here are very clear: All components are tuned to the group, so that they function flawlessly. ODU supplies the complete system, with no intermediate suppliers. 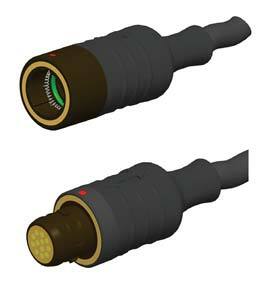 When there is a need for a connection system that has to be small but still robust, light-weight, with simple handling and cleaning and ideally matched to the soldier’s camouflage, then the ODU AMC – Advanced Military Connector connection system from ODU is the solution to all questions.